The European Respiratory Society (ERS) Research Seminar entitled “Physical activity, nutritional status and systemic inflammation in COPD” and organised by the "Clinical Physiology and Exercise" ERS scientific group 4.01, brought together international experts to discuss several important aspects of physical activity, nutritional status and inflammation in chronic obstructive pulmonary disease (COPD) including pathology and pathophysiology, measurement, and clinical and therapeutic implications. A brief summary of the 2-day meeting held in Florence, Italy on November 11th and 12th, 2011, with the main conclusions and perspectives, is hereafter reported. COPD is undoubtedly a disease associated with an abnormal inflammatory reaction in the lung, but accumulating evidence shows that it is also associated with systemic inflammation [1–4], particularly during exacerbations of the disease  with consequences for the cardiovascular system, metabolism and skeletal muscles [6, 7]. The systemic consequences that may be related to systemic inflammation include: cardiovascular disease, obesity, hypertension, type 2 diabetes, depression, deconditioning, malnutrition, atrophy and dysfunction of skeletal muscles, physical inactivity, osteoporosis, and anaemia and bone marrow dysfunction [8–20]. In the last decade, the relationship of comorbidities with systemic inflammation in COPD has been extensively investigated. This is because most of the COPD patients (>70%) that are seen in the clinic present with one or more comorbid conditions . The clinical association between chronic respiratory diseases, obesity, cardiovascular and metabolic diseases is not surprising considering the epidemic proportion of these diseases and the fact that they share common risk factors such as ageing, smoking, low levels of physical activity and a Western obesogenic diet. What is less appreciated is that all these diseases independently predict cardiovascular risk and that the association between chronic respiratory, cardiovascular and metabolic diseases is likely to go beyond a simple association of frequent diseases . In fact, the current evidence, albeit modest, points towards a possible synergy between chronic respiratory, cardiovascular and metabolic diseases in such a way that, when combined, they probably interact to promote: 1) a worsening of their natural evolution, 2) impaired functional capacity, 3) worsening of dyspnoea, 4) reduced health-related quality of life, and 5) increased mortality . Some authors have suggested the term “complex chronic diseases” to depict this situation . This may refer either to patients with multi-morbidities or to the fact that most chronic diseases (e.g. COPD and diabetes) do not reflect one phenotype but are complex diseases with different phenotypes in different disease stages. The implication of this concept is that treating only one chronic disease in isolation while neglecting to pay attention to other concomitant chronic conditions is likely to lead to suboptimal health benefits. Importantly, an unprecedented increase in the prevalence of “complex chronic diseases” is expected in the upcoming years . Figure 1 depicts the different levels of impairment in COPD. The different levels of impairment in chronic obstructive pulmonary disease (COPD). FEV1: forced expiratory volume in 1 s.
It is of course tempting to propose a unifying mechanism that would contribute to the development of the comorbid conditions associated with COPD. One such possible mechanism is systemic inflammation which may occur from the “spill-over” of pro-inflammatory mediators from the lung to the systemic circulation . However, the following considerations that point against the systemic nature of COPD should be acknowledged: 1) systemic inflammation is heterogeneously distributed over COPD patients ; 2) its stability over longer periods of time has not been investigated ; 3) whether systemic inflammation, severity of COPD, comorbidities and mortality are intimately interrelated is at present unclear ; and 4) some evidence would suggest that comorbidities seem to be related to age rather than disease severity . The question is, to date, still unanswered. Regardless of the COPD–systemic inflammatory related nature of comorbidities, an intriguing issue is whether comorbidities may be related to the response to rehabilitation [7, 25]. Recently, a retrospective cohort study examined this question. The authors found that the Charlson index and the presence of metabolic disease and heart disease, all reduced the likelihood of a response to rehabilitation (odds ratios ranging from 0.57–0.72) . The negative effect of cardiovascular comorbidities on the response to rehabilitation was confirmed in another study . By way of contrast, rehabilitation is expected to have a beneficial effect on most of the comorbidities that are frequently present in patients undergoing pulmonary rehabilitation . The relationship is, at present, still debated. Limb muscle dysfunction is another major manifestation of COPD . Muscle dysfunction is characterised by muscle strength loss and endurance impairment, the latter being inversely related to increased peripheral muscle fatigue [27–30]. These functional disorders are related to diverse pathophysiological changes in the muscle, namely bioenergetic alterations (poor oxidative capacity) , fibre type redistribution (shift from type I to type II fibres) [32, 33], altered capillarisation , oxidative stress [34–38] and muscle wasting [38–41] affecting a subpopulation of COPD patients. The pathogenic mechanisms responsible for these pathophysiological changes are multifactorial. Systemic inflammation and oxidative/nitrosative stress have been described among these pathogenic mechanisms responsible for muscle dysfunction in COPD [42, 43]. The presence of markers of local inflammation at muscle level is less clear and yet a debatable issue [36, 44–48]. COPD is, thus, a disease of the lungs with extrapulmonary manifestations, among which skeletal muscle dysfunction is an independent prognosis factor and it is responsible, in part, for exercise intolerance in these patients [28–30, 40, 41, 43]. Exercise training is a strategy aimed at restoring exercise tolerance through improving respiratory, cardiovascular, metabolic and peripheral muscle function. Less clear is the ability of exercise training to improve systemic inflammation in COPD patients. We know that exercise can trigger an inflammatory response and oxidative stress in patients with COPD [49–52]. Non-injurious (moderate intensity and short duration) exercise increases the level of circulating inflammatory cells and cytokines, by stimulating interleukin (IL)-6, IL-10 and IL-1ra but inhibiting tumour necrosis factor (TNF)-α [53–55]. These cytokines mobilise energy substrates by regulating glucose metabolism and may regulate muscle remodelling and also attenuate or inhibit the inflammatory response (“anti-inflammatory” effect). However, injurious (high intensity and long duration) exercise triggers an initial inflammatory response by stimulating the release of cytokines (IL-1β and TNF-α) that play a role in the degradation of damaged muscle [53–55]. This is followed by a later phase of regeneration and repair with release of anti-inflammatory cytokines (IL-10, IL-1ra and TNF-R) which modulate muscle remodelling in response to exercise-induced damage. The corollary of this is that “non-injurious” exercise in absolute terms for a healthy subject may be intense (“injurious exercise”) in relative terms for a COPD patient . Indeed, for the same intensity of exercise, COPD patients present an increased lactate production . Even when injurious exercise seems to activate regeneration in healthy people, COPD patients may be susceptible to perpetuated muscle damage . In fact, the magnitude and duration of the injurious and repair phases of the inflammatory response induced by muscle contraction are influenced by individual characteristics [58, 59]. In COPD patients, the effect of systemic inflammation, ageing, lack of previous exposure to exercise (i.e. sedentarism) and exacerbations can be all implicated in a differential inflammatory response to muscle contraction. Older individuals have muscles that are injured more easily after exercise [58–60]. However, several studies report an abnormal inflammatory response to exercise in patients with COPD in comparison to age-matched control subjects [56, 57], pointing out that ageing is only a potential contributory factor. Repetitive bouts of exercise experienced by COPD patients may, therefore, be deleterious. Exercise training fails to reverse systemic inflammation and contributes to impair redox status at muscle level [42, 57, 61, 62]. This situation seems to be even more evident in a subpopulation of COPD patients with muscle wasting and low body mass index [36, 42, 56, 63]. These patients may experience a smaller “therapeutic range” or training safety zone for effective but safer exercise prescription or benefit from additional pharmacological or physiological (e.g. nutrition) interventions. Despite this, exercise training has been proven to be beneficial in ∼70% of COPD patients in terms of exercise tolerance and quality of life, at least in part by improving peripheral muscle function [52, 64, 65]. But what happens in the remaining 30% of COPD patients who benefit less or not at all from pulmonary rehabilitation/exercise training ? The first issue to consider before concluding that some patients are non-responders to pulmonary rehabilitation is the definition of a non-response. This is not a trivial issue because some patients may improve in certain aspects of their disease (e.g. quality of life or symptoms) while not showing large improvements in other aspects (e.g. exercise tolerance). There is evidence that patients with COPD who undergo exercise training experience comparable small decreases in dyspnoea intensity, regardless of whether or not they demonstrate improved exercise tolerance . Should we conclude that such a patient does not respond to rehabilitation? Another issue to consider is the responsiveness of the testing modalities that we use to quantify the impact of pulmonary rehabilitation. For example, some patients may show improvement in exercise tolerance on the constant work-rate endurance cycling test and not on the 6-min walking test . It becomes obvious from these observations that caution should be used before declaring that a patient does not benefit from pulmonary rehabilitation. This being said, it has to be acknowledged that the magnitude of response to pulmonary rehabilitation in COPD is highly variable with some patients showing little or no benefit at all. Similar observations have been made in healthy individuals and there is a genetic component to this phenomenon [69–71]. As such, the high individual variability in the response to training is not unique to COPD. It is also interesting to consider that the nature of the skeletal muscle response to exercise training may differ in patients with COPD compared with healthy subjects . The lack of response to exercise training may also be related to the inability to tolerate sufficient intensity and/or duration of training and/or to poor compliance to the training intervention. For example, high intensity or longer duration programmes have been associated with a larger response compared with less intense or shorter programmes [73, 74]. Patients who present with significant contractile fatigue after an exercise training session also show more pronounced training effects . Some COPD patients with pronounced muscle wasting (cachectic patients) seem to be more prone to the effect of oxidative stress and inflammation at the muscle level [51, 62, 63, 76]. This issue is important because muscle wasting occurs in ∼35% of severe COPD patients eligible for pulmonary rehabilitation  but also in 20% of outpatients with moderate airflow obstruction , and is predictive of increased mortality [40, 41]. In addition, there are studies indicating that several mechanisms impair muscle remodelling in cachectic COPD patients, such as inhibition of myogenesis, increased protein degradation and decreased protein synthesis [76, 79]. Although exercise training/pulmonary rehabilitation produces less peripheral muscle fibre phenotypical adaptations/remodelling in cachectic than in non-cachectic COPD patients, cachectic COPD patients are able to increase exercise capacity as much as those without cachexia . It is tempting to speculate that the limited training effect in peripheral muscle fibre remodelling in cachectic COPD patients could be attributed to the simultaneous activation of hypertrophy (insulin-like growth factor 1 and mechano-growth factor) and atrophy (ubiquitin proteasome) signalling pathways with exercise training . However, this really needs to be confirmed in future research. In addition, it should be emphasised that both training intensity and duration may have also played a crucial role in the blunted response to exercise training in cachectic COPD. It is clear that, from a clinical standpoint, predicting the effectiveness and the magnitude of the response to exercise training in an individual COPD patient remains challenging. The initial mechanisms of exercise limitation appear to affect the exercise outcome to pulmonary rehabilitation . Recent information suggests that COPD patients who develop quadriceps contractile fatigue during exercise training show greater training effects in terms of functional exercise capacity and health-related quality of life . The typical clinical portrait of a patient with COPD “responder” to exercise training looks like someone whose poor exercise tolerance is related mainly to weak skeletal muscles (i.e. fatigue) and not to ventilatory limitation/constraint [66, 81]. The corollary of this is, therefore, that “non-fatiguers” should benefit less from rehabilitation than “fatiguers”. This is, however, not completely true, because it has recently been shown that exercise tolerance has improved after rehabilitation even in “non-fatiguers” . The picture is very complex, and may involve several other contributing factors such as exertional dyspnoea, ventilatory limitation/constraint, dynamic lung hyperinflation and lack of motivation. Strategies are currently under investigation to improve the rate of response to pulmonary rehabilitation. The first step is to optimise the pharmacological treatment . Oxygen , heliox , noninvasive ventilation , interval training , one-legged exercises  and nutritional support as adjunct to exercise training [88, 89] are examples of pharmacological and non-pharmacological interventions. Several unanswered questions need to be addressed in the future: 1) the definition of non-responders from a research standpoint and from a clinical standpoint; 2) it is still unclear what happens in the peripheral muscles of non-cachectic COPD patients (at least 40%) who do manifest a reduction of the systemic inflammatory mediator levels or the local muscle expression of TNF-α and IL-6 in response to exercise training; 3) the mechanisms by which exercise capacity improves after rehabilitation in cachectic COPD patients in spite of less peripheral muscle fibre phenotypical adaptations than non-cachectic COPD patients, are still unknown and await a better understanding of their underlying physiology; 4) the potential role of ventilatory constraints and exertional dyspnoea in modulating the response to exercise training in cachectic COPD patients is still unknown and needs to be explored; 5) exercise training has been shown to reverse some of the metabolic abnormalities associated with deconditioning and ameliorate exercise tolerance; however, optimisation of training programmes is needed; 6) what is the best approach to intervene: nutritional or anabolic supplements alone or in combination with exercise; 7) nutritional supplements to be given: high content of proteins (20% of total calories), or predominance of carbohydrates over fat, or antioxidants enrichment? ; 8) the role of anabolic agents, ghrelin (orexigenic properties), N-3 polyunsaturated fatty acids and, recently, the involvement of peroxisome proliferator-activated receptors; 9) in selected patients, such as cachectic COPD patients, a promising approach is represented by the integration of adequate increased caloric intake (until body mass is recovered) with muscle training; and 10) the involvement of other organs (e.g. adipose tissue) and (changes in) body composition in systemic inflammation. Nonetheless, even when taking into account the proportion of non-responders, pulmonary rehabilitation remains a very effective, safe and potent intervention to improve quality of life, dyspnoea and exercise tolerance in COPD. The complex interplay between dynamic hyperinflation, pulmonary inflammation and acute exacerbation in COPD has not been fully elucidated. The question arises as to whether hyperinflation could contribute to the inflammatory consequences of COPD and how, in turn, exacerbations could worsen hyperinflation. Hyperinflation, both occurring at rest (static hyperinflation) and during exercise (dynamic hyperinflation), and exacerbations are two critical features of COPD. Their presence profoundly affect the clinical picture of the disease since they are associated with dyspnoea , exercise intolerance , negative energy, balance/weight loss, more rapid decline in forced expiratory volume in 1 s [91, 92] and poor quality of life . As such, having a better understanding of the interplay between these three features of COPD would seem important to help to develop more efficient therapeutic interventions for this disease. Hyperinflation and exacerbation may be considered to be independent from each other: hyperinflation is typically considered as a pure mechanical event while exacerbations would be described as inflammatory phenomena, characterised by a worsening in airway and systemic inflammation [94, 95]. Whether the mechanical derangements of the respiratory system seen in COPD could contribute to the inflammatory state has been discussed recently . The most convincing evidence in support of this theory is emerging from the field of critical care and acute respiratory distress syndrome, suggesting that lung over-distention may be associated with the release from the lungs of pro-inflammatory cytokines in the systemic circulation . Conversely, a mechanical ventilation strategy that aims at minimising over-distention has been reported to reduce the systemic pro-inflammatory cytokine response . From these data, it is tempting to speculate that a similar systemic inflammatory response may also be associated with the occurrence of dynamic hyperinflation in COPD. There is, however, only meagre evidence supporting evidence for this concept. We know for example that exercise may be associated with an increase in inflammatory markers in the systemic circulation in patients with COPD, particularly in the presence of cachexia [50, 51]. It is however uncertain whether this immunological response originates from the distended lungs or whether it comes from the contracting limb muscles and/or from the activation of inflammatory cells. Along this line, it should be noted that healthy subjects also exhibit an exercise-related immunological response that is occurring despite the fact that operating lung volumes remain stable or even decrease during exercise in these individuals. This makes it difficult to ascribe the immunological response seen in COPD solely to the presence of dynamic hyperinflation. The evidences regarding the potential impact of over-distention on inflammation in COPD are only indirect and potentially conflicting. Inhaled corticosteroids alone do not exert a huge impact on airway inflammation associated with COPD  but have been reported to be associated with a decrease in systemic inflammation [100, 101] and, more recently, with lung deflating effects . This would seem to argue for a potential inflammatory effect of lung over-distention in COPD. Conversely, the fact that obese patients with COPD breathe at lower lung volumes compared with their lean counterparts  while exhibiting a greater degree of systemic inflammation  does not support the idea that hyperinflation is a major player in the creation of a systemic inflammatory response in this disease. In fact, obesity that is clearly associated with a reduction in lung volumes is a strong predictor of the level of systemic inflammation seen in COPD. The current evidence does not allow a definitive conclusion to be drawn on the potential relationship between lung over-distention and systemic inflammation in COPD. At the same time, exacerbations which are most commonly seen as inflammatory events are also associated with mechanical derangements within the respiratory system, including worsening in hyperinflation [105, 106]. Considering that exacerbations are currently defined based on dyspnoea worsening, these mechanical derangements which modulate the perception of dyspnoea are central in the definition and recognition of an exacerbation. It can thus be envisioned as a vicious cycle where exacerbations promote further worsening in lung over-distention which in turn might promote more inflammation and worsening in pulmonary function . The starting point for this research seminar was the well-known physical inactivity in COPD that for many years has been blamed on abnormal peripheral muscle function and respiratory function, reflected by both lung mechanics and gas exchange. The principal overarching question posed was whether part of the blame lies with the systemic inflammation as well, and if so, how. Several lines of evidence do suggest that COPD is associated with systemic inflammation which may lead to consequences (comorbidities?) for the cardiovascular system, metabolism and skeletal muscles. However, such evidence, coming from morphological, biochemical and physiological measures that have only recently begun to be studied in depth, is itself somewhat difficult to interpret, so that while such comorbidities clearly exist, whether they are related to a systemic consequence of COPD per se (“spill-over” of pro-inflammatory mediators from the lung to the systemic circulation) or just to ageing (patients with COPD are often elderly) or to clinical COPD phenotypes independent of comorbid conditions, remains at present unclear. Part of the problem also resides in the fact that it is still not entirely clear whether exercise has anti-inflammatory or pro-inflammatory effects, and whether local and/or systemic inflammation has deleterious effects on muscle contractility (fatiguers versus non-fatiguers), whether it contributes to muscle wasting (cachectic versus non-cachectic) and whether it has clinical implication in the response to exercise training during a rehabilitation programme in COPD (responders versus non-responders). Part of the problem comes also from what constitutes the most appropriate exercise tests (cycling versus walking) , modalities (incremental versus constant work rate) , intensities and duration  as well as the most appropriate set of control subjects against which to compare exercise in patients with COPD and comorbidities. The consensus of the group was that a proper evaluation of patients with COPD requires an integrative approach that takes into account all potential systemic manifestations into a multidimensional picture. In this context, understanding the nature and the extent of the interactions between chronic respiratory, cardiovascular and metabolic diseases is an important medical challenge of the 21st century, and failing to address this new reality will only contribute to the progression of the phenomenon and to unparalleled adverse health consequences. In conclusion, this workshop has laid out broad research directions (table 1) to allow a better mechanistic understanding of the relationship between physical (in)activity, nutritional status and pulmonary and systemic inflammation in COPD. Hopefully these will lead to pharmacological and non-pharmacological advances that will not only improve quality of life but also prolong it in the face of currently disappointing functional outcomes from the few available therapeutic approaches. The members of the ERS Research Seminar Faculty are as follows: P. Laveneziana (co-chair; Paris, France), P. Palange (co-chair; Rome, Italy), M. Decramer (Leuven, Belgium), L. Puente-Maestú (Madrid, Spain), F. Maltais (Quebec, Canada), R. Rabinovich (Edinburgh, UK), I. Vogiatzis (Athens, Greece), T. Troosters (Leuven, Belgium), H.R. Gosker (Maastricht, the Netherlands), A. Schols (Maastricht, the Netherlands), G. Scano (Florence, Italy) and E. Barreiro (Barcelona, Spain). The participants (52 + 2 ERS scientific activities assistants) of the ERS Research Seminar Faculty were as follows: A. Neder (Brazil), A. Bellocq (France), R. Garrod (France), A. Huertas (France), L. Laviolette (France), V. Andrianopoulos (Greece), Z. Louvaris (Greece), S. Stavroula (Greece), A. Aliverti (Italy), E. Clini (Italy), G. Mileti (Italy), K. Wadell (Sweden), S. Ward (UK), B. Marinov (Bulgaria), A. Chambellan (France), F. Costes (France), E. Kortianou (Greece), I. Nasis (Greece), M. Vasilopoulou (Greece), J. Varga (Hungary), S. Devi Perumal (India), G. Fiorenzano (Italy), D. Savi (Italy), A. Chwist-Nowak (Poland), D.L. Ardelean (Romania), B. Nadezda (Russia), P. Joppa (Slovakia), R. Zwick (Austria), P. Gagnon (Canada), B. Lemire (Canada), F. Ribeiro (Canada), R. de Paula Vieira (Germany), P. Roussi (Greece), E. Bernardi (Italy), B. Binazzi (Italy), M. Brunori (Italy), C. Coli (Italy), R. Duranti (Italy), F. Gigliotti (Italy), G. Innocenti Bruni (Italy), B. Lanini (Italy), I. Presi (Italy), I. Romagnoli (Italy), W. Altenburg (the Netherlands), T.E. Eriksen (Norway), M. Emtner (Sweden), J. Hartman (the Netherlands), P. Klijn (the Netherlands), D. Inal-Ince (Turkey), D. Yilmaz (Turkey), P. Collins (UK), E. Gagliardi (Italy), and V. Rebeaud and L. Monnot (ERS scientific activities assistants, Switzerland). The research seminar was sponsored by the ERS with the financial support of an unrestricted grant from Boehringer-Ingelheim (Italy) and Pfizer (Italy)).
. From COPD to chronic systemic inflammatory syndrome? Lancet 2007; 370: 797–799.
. Systemic effects of chronic obstructive pulmonary disease. Eur Respir J 2003; 21: 347–360.
. Muscle force during an acute exacerbation in hospitalised patients with COPD and its relationship with CXCL8 and IGF-I. Thorax 2003; 58: 752–756.
. Anemia in chronic obstructive pulmonary disease: epidemiology and economic implications. Curr Med Res Opin 2008; 24: 1123–1130.
. COPD as a lung disease with systemic consequences – clinical impact, mechanisms, and potential for early intervention. COPD 2008; 5: 235–256.
. Insulin resistance and inflammation - a further systemic complication of COPD. COPD 2007; 4: 121–126.
. Prevalence of comorbidities in patients with chronic obstructive pulmonary disease. Respiration 2010; 80: 112–119.
. Circulating haemopoietic and endothelial progenitor cells are decreased in COPD. Eur Respir J 2006; 27: 529–541.
. Abnormal mitochondrial function in locomotor and respiratory muscles of COPD patients. Eur Respir J 2009; 33: 1045–1052.
. Chronic obstructive pulmonary disease, asthma, and risk of type 2 diabetes in women. Diabetes Care 2004; 27: 2478–2484.
. Chronic obstructive pulmonary disease, inflammation and co-morbidity – a common inflammatory phenotype? Respir Res 2006; 7: 70.
. The potential impact of anaemia of chronic disease in COPD. Eur Respir J 2006; 27: 390–396.
. Characterisation of COPD heterogeneity in the ECLIPSE cohort. Respiratory Res 2010; 11: 122.
. Multi analyte profiling and variability of inflammatory markers in blood and induced sputum in patients with stable COPD. Respiratory Res 2010; 11: 41.
. Clinical predictors of the efficacy of a pulmonary rehabilitation programme in patients with COPD. Respir Med 2009; 103: 1124–1130.
. Treatment of chronic obstructive pulmonary disease and its comorbidities. Proc Am Thorac Soc 2008; 5: 848–856.
. Quadriceps fatigability after single muscle exercise in patients with chronic obstructive pulmonary disease. Am J Respir Crit Care Med 2003; 168: 102–108.
. Contractile leg fatigue after cycle exercise: a factor limiting exercise in patients with chronic obstructive pulmonary disease. Am J Respir Crit Care Med 2003; 168: 425–430.
. Quadriceps fatigue after cycle exercise in patients with chronic obstructive pulmonary disease. Am J Respir Crit Care Med 2000; 161: 447–453.
. Oxidative capacity of the skeletal muscle and lactic acid kinetics during exercise in normal subjects and in patients with COPD. Am J Respir Crit Care Med 1996; 153: 288–293.
. Muscle fibre type shifting in the vastus lateralis of patients with COPD is associated with disease severity: a systematic review and meta-analysis. Thorax 2007; 62: 944–949.
. Chronic obstructive pulmonary disease: capillarity and fiber-type characteristics of skeletal muscle. J Cardiopulm Rehabil 1998; 18: 432–437.
. Exercise-induced quadriceps oxidative stress and peripheral muscle dysfunction in patients with chronic obstructive pulmonary disease. Am J Respir Crit Care Med 2003; 167: 1664–1669.
. Nitric oxide synthases and protein oxidation in the quadriceps femoris of patients with chronic obstructive pulmonary disease. Am J Respir Cell Mol Biol 2003; 29: 771–778.
. Cytokine profile in quadriceps muscles of patients with severe COPD. Thorax 2008; 63: 100–107.
. The mitochondrial phenotype of peripheral muscle in chronic obstructive pulmonary disease: disuse or dysfunction? Am J Respir Crit Care Med 2008; 178: 1040–1047.
. Profiling of mRNA expression in quadriceps of patients with COPD and muscle wasting. COPD 2008; 5: 75–84.
. Catabolic/anabolic balance and muscle wasting in patients with COPD. Chest 2003; 124: 83–89.
. Effects of rehabilitative exercise on peripheral muscle TNFalpha, IL-6, IGF-I and MyoD expression in patients with COPD. Thorax 2007; 62: 950–956.
. Skeletal muscle weaknes., reduced exercise tolerance, and COPD: is systemic inflammation the missing link? Thorax 2006; 61: 1–3.
. Markers of inflammation and disuse in vastus lateralis of chronic obstructive pulmonary disease patients. Eur J Clin Invest 2007; 37: 897–904.
. Does systemic inflammation trigger local exercise-induced oxidative stress in COPD? Eur Respir J 2004; 23: 538–544.
. Skeletal muscle inflammation and nitric oxide in patients with COPD. Eur Respir J 2005; 26: 390–397.
. Inflammatory cells and apoptosis in respiratory and limb muscles of patients with COPD. J Appl Physiol 2011; 111: 808–817.
. Cigarette smoke-induced oxidative stress: a role in chronic obstructive pulmonary disease skeletal muscle dysfunction. Am J Respir Crit Care Med 2010; 182: 477–488.
. Skeletal muscle response to inflammation – lessons for chronic obstructive pulmonary disease. Crit Care Med 2009; 37: S372–S383.
. Systemic immunological response to exercise in patients with chronic obstructive pulmonary disease: what does it mean? Respiration 2006; 73: 255–264.
. Exercise-induced systemic effects in muscle-wasted patients with COPD. Med Sci Sports Exerc 2006; 38: 1543–1552.
. Muscle and blood redox status after exercise training in severe COPD patients. Free Radic Biol Med 2012; 52: 88–94.
. Exercise and the inflammatory response in chronic obstructive pulmonary disease (COPD) – does training confer anti-inflammatory properties in COPD? Med Hypotheses 2007; 68: 291–298.
. The anti-inflammatory effect of exercise. J Appl Physiol 2005; 98: 1154–1162.
. The acute phase response and exercise: court and field sports. Br J Sports Med 2001; 35: 170–173.
. Mitochondrial dysfunction in COPD patients with low body mass index. Eur Respir J 2007; 29: 643–650.
. Increased tumour necrosis factor-α plasma levels during moderate-intensity exercise in COPD patients. Eur Respir J 2003; 21: 789–794.
. Senescence of human skeletal muscle impairs the local inflammatory cytokine response to acute eccentric exercise. FASEB J 2005; 19: 264–266.
. High-volume, heavy-resistance strength training and muscle damage in young and older women. J Appl Physiol 2000; 88: 1112–1118.
. Plasma creatine kinase activity and exercise-induced muscle damage in older men. Med Sci Sports Exerc 1991; 23: 1028–1034.
. Cellular protein breakdown and systemic inflammation are unaffected by pulmonary rehabilitation in COPD. Thorax 2007; 62: 109–114.
. Reduced muscle redox capacity after endurance training in patients with chronic obstructive pulmonary disease. Am J Respir Crit Care Med 2001; 164: 1114–1118.
. Training depletes muscle glutathione in patients with chronic obstructive pulmonary disease and low body mass index. Respiration 2006; 73: 757–761.
. Success in pulmonary rehabilitation in patients with chronic obstructive pulmonary disease. Can Respir J 2010; 17: 219–223.
. 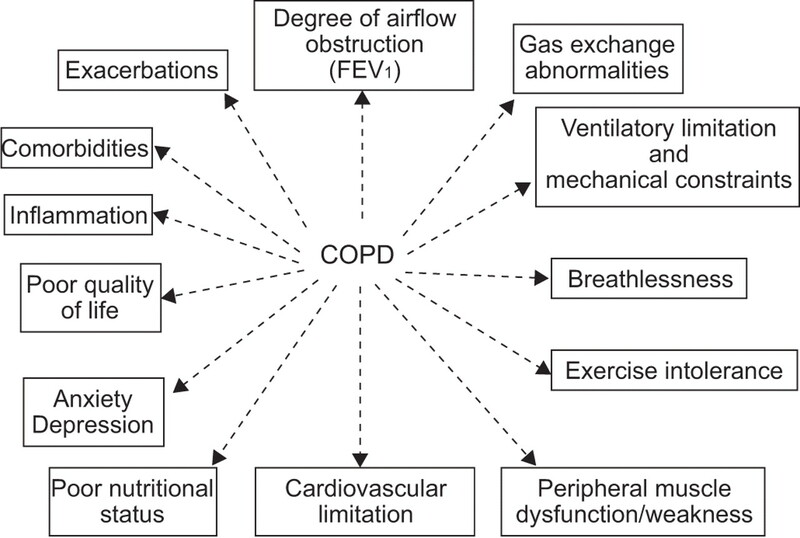 Pulmonary rehabilitation in chronic obstructive pulmonary disease. Am J Respir Crit Care Med 2005; 172: 19–38.
. Exercise training in COPD: how to distinguish responders from nonresponders. J Cardiopulm Rehabil 2001; 21: 10–17.
. Stability of dyspnea ratings after exercise training in patients with COPD. Med Sci Sports Exerc 2003; 35: 1083–1087.
. Assessing the impact of pulmonary rehabilitation on functional status in COPD. Thorax 2008; 63: 115–121.
. Genomic predictors of the maximal O uptake response to standardized exercise training programs. J Appl Physiol 2011; 110: 1160–1170.
. A transcriptional map of the impact of endurance exercise training on skeletal muscle phenotype. J Appl Physiol 2011; 110: 46–59.
. Using molecular classification to predict gains in maximal aerobic capacity following endurance exercise training in humans. J Appl Physiol 2010; 108: 1487–1496.
. Effects of exercise training on quadriceps muscle gene expression in chronic obstructive pulmonary disease. J Appl Physiol 2007; 102: 1976–1984.
. Reductions in exercise lactic acidosis and ventilation as a result of exercise training in patients with obstructive lung disease. Am Rev Respir Dis 1991; 143: 9–18.
. Are patients with COPD more active after pulmonary rehabilitation? Chest 2008; 134: 273–280.
. Effectiveness of exercise training in patients with COPD: the role of muscle fatigue. Eur Respir J 2011; [Epub ahead of print DOI: 0.1183/09031936.00111811].
. Chronic endurance exercise induces quadriceps nitrosative stress in patients with severe COPD. Thorax 2009; 64: 13–19.
. Nutritional depletion in relation to respiratory and peripheral skeletal muscle function in out-patients with COPD. Eur Respir J 1994; 7: 1793–1797.
. NF-κB activation and iNOS upregulation in skeletal muscle of patients with COPD and low body weight. Thorax 2004; 59: 483–487.
. Effect of pulmonary rehabilitation on muscle remodelling in cachectic patients with COPD. Eur Respir J 2010; 36: 301–310.
. Exercise outcomes after pulmonary rehabilitation depend on the initial mechanism of exercise limitation among non-oxygen-dependent COPD patients. Chest 2005; 127: 110–116.
. Improvement in exercise tolerance with the combination of tiotropium and pulmonary rehabilitation in patients with COPD. Chest 2005; 127: 809–817.
. Benefits of supplemental oxygen in exercise training in nonhypoxemic chronic obstructive pulmonary disease patients. Am J Respir Crit Care Med 2003; 168: 1034–1042.
. Helium-hyperoxia: a novel intervention to improve the benefits of pulmonary rehabilitation for patients with COPD. Chest 2009; 135: 609–618.
. New strategies to improve exercise tolerance in chronic obstructive pulmonary disease. Eur Respir J 2004; 24: 313–322.
. Skeletal muscle adaptations to interval training in patients with advanced COPD. Chest 2005; 128: 3838–3845.
. Effects of one-legged exercise training of patients with COPD. Chest 2008; 133: 370–376.
. Efficacy of nutritional supplementation therapy in depleted patients with chronic obstructive pulmonary disease. Nutrition 2003; 19: 120–127.
. Physiologic effects of nutritional support and anabolic steroids in patients with chronic obstructive pulmonary disease. A placebo-controlled randomized trial. Am J Respir Crit Care Med 1995; 152: 1268–1274.
. Acute exacerbations of chronic obstructive pulmonary disease are accompanied by elevations of plasma fibrinogen and serum IL-6 levels. Thromb Haemost 2000; 84: 210–215.
. Dynamic hyperinflation and pulmonary inflammation: a potentially relevant relationship? Eur Respir Rev 2006; 15: 68–71.
. Multiple system organ failure. Is mechanical ventilation a contributing factor? Am J Respir Crit Care Med 1998; 157: 1721–1725.
. Effect of salmeterol/fluticasone propionate on airway inflammation in COPD: a randomised controlled trial. Thorax 2007; 62: 938–943.
. The effects of fluticasone with or without salmeterol on systemic biomarkers of inflammation in chronic obstructive pulmonary disease. Am J Respir Crit Care Med 2008; 177: 1207–1214.
. Effects of fluticasone on systemic markers of inflammation in chronic obstructive pulmonary disease. Am J Respir Crit Care Med 2004; 170: 760–765.
. Effect of adjunct fluticasone propionate on airway physiology during rest and exercise in COPD. Respir Med 2011; 105: 1836–1845.
. Combined effects of obesity and chronic obstructive pulmonary disease on dyspnea and exercise tolerance. Am J Respir Crit Care Med 2009; 180: 964–971.
. Metabolic and inflammatory profile in obese patients with chronic obstructive pulmonary disease. Chron Respir Dis 2008; 5: 35–41.
. COPD exacerbations. 3: Pathophysiology. Thorax 2006; 61: 354–361.
. Physiological changes during symptom recovery from moderate exacerbations of COPD. Eur Respir J 2005; 26: 420–428.
. Ventilatory and metabolic adaptations to walking and cycling in patients with COPD. J Appl Physiol 2000; 88: 1715–1720.
. Recommendations on the use of exercise testing in clinical practice. Eur Respir J 2007; 29: 185–209.